My name is Alechia, Alechia Mupin. And as you may guess, I'm a Chia. A very smart yellow Chia! Daddy once told me my grand-grand-grand-graaaaand-grandfather Heracle Mupin was a detective, and that's what I want to be when I grow up. Besides their beauty, Chias are known for being experts in safety and investigation. 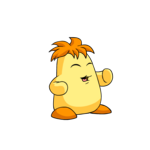 You probably know the famous Chia Police that protects us here in Neopia. He's my idol, as my grandfather. But actually, I don't know if my father was telling the truth about Heracle Mupin, because Daddy likes to invent things. As when I asked why some faellies stopped flying all of a sudden in Faerieland. He told me it was due to the cyclonical winds of faerie wings, but I researched a lot and found out it was because they accidentally hit the Hidden Tower. But with detectives or not in my family, that's what I want to be when I grow up. I know that there are already many pet detectives (and even petpet detectives) in Neopia, because their stories are published in the Neopian Times every week, but I don't care. We must follow our dreams, don't we? Daddy is a doctor at the Neopian Hospital, and he's very intelligent. And he always brings me breakfast in bed! Actually, not always, but when I get good grades at school or help him in his research. Usually, the breakfast includes lots of baby food and jam. I'm not a baby, but I love baby food. My mom prepares baby food for us and also to sell. She's the best baby food and jam maker in the whole of Neopia! That's why the kitchen is very big in our neohome. There's a big counter that separates the part where we have our meals together from the part where my mother welcomes the customers. There's even a 'welcome' board hanging on the ceiling. The store was going to be called 'Jelly World', but we all thought that was a very silly name, so we painted 'Jam Palace' on the door. Early in the morning, the Jam Palace is the best place to think about the mysteries I solve, because everyone is still sleeping and I can use the tables to put lots of papers and notes. I also have a spyglass (like Kentari's, I adore him!) and magical lenses I got once I visited the Coltzan Shrine in the Lost Desert, with my parents. For me, that was proof of the great wisdom of King Coltzan. When I got closer to the shrine (and I was just a baby Chia that time), he somehow knew lenses would be a great prize for a future detective. Since then, I carry those objects everywhere, because solving mysteries is what I like most! Oh, and I almost forgot to tell something important. I also carry Merlock everywhere! 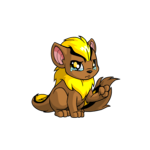 Merlock is my Snarhook, the petpet I love most! He’s incredibly smart, and with his long nose he is able to notice when something is smelling bad. And that's very useful when we are looking for evidences in a mysterious place! We are an incredible team, and together we can solve any mystery in Neopia! And a mystery appeared early in the morning! Our neighbour, Mrs. Mapple, came to the Jam Palace as soon as Mummy opened the door. I was still having breakfast. I noticed Mrs. Mapple was very nervous, whiter than she normally is (she's a white Poogle). She told Mom someone stole the Gold Valentines Ring she received from Mr. Mapple ten years ago! And today they were going to have dinner at Kelp and she intended to wear that ring. She was awfully sad. She had gone to the market to buy some fruits, and when she came back home, she took a look at her jewel box and the ring wasn't there. "What will my dear Sagliesh do when he find out I lost the ring he gave me?" she asked, sobbing. "Oh, dear, look for it a bit more, maybe it just felt somewhere," Mom answered. "I'm sure it didn't fall. I always left that ring on the jewel box in the first drawer of my wardrobe. I took everything off the drawer, the wardrobe, the whole room. The ring was not there. And I'm sure it was, yesterday night, when I took my earrings off to sleep. Maybe the Meerca Brothers entered my house while I was out and..."
"Don't you think that burglars would take all the jewels, instead of stealing a single ring?" I said, and they looked at me. Something was very strange. "Maybe the ring was not stolen." They were still looking at me. "Maybe if I try to find it..."
"Go on, Alechia," Mrs. Mapple said, crying. She sat on a bench near the counter and covered her face with a handkerchief. "I would try anything to get that ring back." I ran upstairs calling Merlock. My snarhook came from behind the curtain and moved his nose. "You're right, we have a mystery to solve!" It took less than one minute for me to find a note and a pencil. Then, I wrote every aspect of the mystery. "Facts: The incredibly precious Gold Valentines Ring owned by Mrs. Mapple disappeared. She had seen the ring on the night before, inside a jewelry box. In the morning, after she came back from the market, the ring was gone." I read that again and showed Merlock. "See? That's our mystery." Then I started writing again. "Situation: That ring is very expensive. She intended to wear the ring tonight, at Kelp. So, we have a very very shot time to investigate." Merlock jumped on my shoulder. I took my magical lenses and put my Twisted Roses cap. Every detective must wear a nice hat, to protect the ideas. "Let's go to Mrs. Mapple’s neohome, Merlock!" The room was completely messy. If my mother had seen that, she would tell Mrs. Mapple to clean everything up. She always does that when my room is messy. But I was not there to judge Mrs. Mapple's organization, but to find her ring. The drawer was open, as the jewelry box. The clothes (even a new Spring Flower Wig!) were all around. Probably Mrs. Mapple ran to the Jam Palace right after she noticed the ring was missing and left the room in that fuzz. I can't blame her; the jams from the Palace are so great that anyone feels better after eating a little bit. I noticed that in that drawer were the fanciest shirts and dresses of Mrs. Mapple. No common T-shirts, like all those I get on the Tyrannian Concert hall, but just the best from the clothing store. All of them were very delicate. I took my lenses and Merlock jumped from my shoulder to the drawer. "Be careful with your nails, Merlock. Don't rip anything. Mrs. Mapple will probably want to wear some of those beautiful shirts tonight at Kelp." He moved back, but not without showing me a very strange thing: it seemed a bunch of green hair, but thicker... Green fur! I also took a little ripped piece of paper with some letters written: AUND. I closed the drawer to open the one below it, and the wood made a creaky noise. I opened it again, the once more, it creaked. Looking carefully and thinking a little bit, I got it! I ran to the post office and sent a neomail. "Good afternoon. Did you receive the package labeled as Mrs. Mapple's? May I take a look to see if the correct piece was sent? Thanks a lot," it said. A few seconds later, the answer came (thanks for the great services, Post Office!). "Yes, the package is here. We didn't start working on it yet. We'll be waiting." Once more, I ran (I've been doing this a lot!) until I was where I wanted to be. 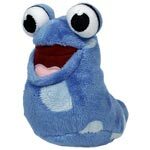 A kind Gnorbu was behind a counter, smiling at me. "Hi, I'm Alechia. I sent that neomail." "I know you, Alechia. I wouldn't have replied your neomail if I didn't. Your mother makes great baby food. Here is Mrs. Mapple's pack, take a look." I put my hand on the pack the Gnorbu showed me and voilà! When I pushed my hand back, the Gold Valentines Ring was there, in my finger! Now, I just had to tell Mrs. Mapple! I turned to the door to go home, but turned back (Merlock almost felt off my shoulder) and said, "Oh, it's the right shirt, you can wash it!" Mrs. Mapple’s case was simpler than I thought. I explained everything to her while we had a snack at the Jam Palace. She was very moved. With her right hand, she held the toast with jam, and in the left hand, sparkling in her fingers, she was wearing the Gold Valentines Ring she received from Mr. Mapple ten years ago. “Yesterday night, as you told me, Mrs. Mapple, you put your jewelry at your jewel box at the drawer. But, as Mr. Mapple was already asleep, you decided not to close the drawer,” I said. She stopped looking at the ring and looked at me, surprised. She should be asking herself how could I know that. But after I found out that was a very creaking drawer, I was sure of what happened. My client didn’t move. Some jam started to drip from the toast. “Alechia, you’re a genius!,” she said. I smiled, and said in Merlock’s ear, “Yep, and you too, Merlock!” Case closed. Apparently, Slorgmo doesn't get jokes.